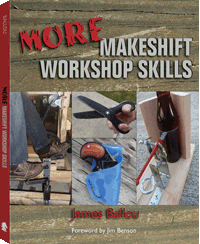 200 pages, 8.5" x 11"
James Ballou tapped a nerve with his best-selling Makeshift Workshop Skills for Survival and Self-Reliance , and now he's back with even more plans, projects, and concepts for do-it-yourself craftsmen, preppers, and anyone interested in creative improvised workshop methods. Get set to learn how to make dozens of useful items out of nothing more than scrounged materials or common, inexpensive products found in every home. More homemade tools and hardware—When there is no hardware store, you'll need to know how to make your own tools and parts. Learn even more clever ways to make your own screwdrivers, scissors, saws, screws, nuts, hinges . . .
More manually powered machines—When there is no electricity, manually powered machines will need to replace your power tools. Learn how to make workshop machines operated by foot pedals, hand cranks, treadles, spring-poles . . .
More makeshift construction—When you're low on cash, it's convenient to be able to construct your own useful things instead of shelling out money at the store. Now you can create all sorts of functional items out of discarded plastic, scrap metal, duct tape, empty bottles, spent ammo . . .
More makeshift mindset—When you can't just drop by the store for the parts or tools needed to complete a project, your most important tool will be your mind. Ballou helps you develop a "makeshift mindset" so you, too, can come up with unconventional ways to accomplish your workshop goals . . .
All this, plus even more intriguing projects that are not only practical to have but fun to build. Learn how to assemble your own hand truck out of ordinary steel pipe, form a handsome knife sheath and pistol holster out of a worn-out bucket, put together a spectacular pedal-powered lathe out of common lumber and parts, and much more! - Which Brand to use?